This is an activity I use with my social pragmatic groups. The activity requires students to use a trial and error method of problem solving. It is a good one to use for defeating Rock Brain because to be successful students need to be willing to try different moves. For students who fall apart when they are wrong, it provides opportunity to defeat Glass Man. This activity can be used to reinforces the idea that mistakes are not necessarily bad and can be used for learning. It is important to talk about this before you begin so students have the tools to work through their feelings in a constructive manner. This activity also teaches students to work together toward a common goal. The solution will be found by observing the mistakes of everyone and it would be very difficult to succeed individually. Students also need to use their short term memory and make inferences to predict the pattern. This activity can be used with small groups of students, two competing teams, or with one or two students. The object of the game is to cross a 6×6 grid of steps using the correct pattern. I lay the grid out on the floor so that students have a good view and can use motor movement. Pattern cards are made A judge, who could be a student or teacher, is selected. The judge takes one of the pattern cards that will be the solution to the stepping pattern. 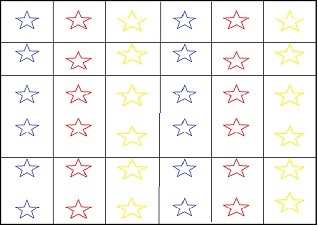 A student begins the challenge by stepping on one of the stars in the first row and moves one row ahead for each step. As the move is made the judge indicates if it is the correct one by saying right or wrong move. A buzzer for a wrong move adds a game show feature and are available free as an app. If it is the right step the student continues to move forward. If it is the wrong step the person returns to the start or the end of the line and watches the attempts of others until they get to the front of the line again. The students may notice that a pattern is developing as students discover the correct moves. This will speed up the progress until someone finally makes it across. Everyone that was paying attention can then make the crossing. Students should be reinforced for working as a team and not as an individual competition to make it to the finish. It doesn’t take much to make pattern cards and a grid on your own. However, if you prefer to have some of the work done for you, I am putting a set up on the TPT store for download at a minimum cost.